It's World Backup Day. Is Your Data Safe? What? 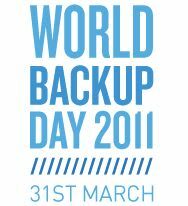 You&apos;ve never heard of World Backup Day? That&apos;s ok, it was proposed about a week ago by Redditors. But still, the idea&apos;s a good one! It&apos;s a sad but true fact of life that hard drives tend to crash. It&apos;s also a sad but true fact of life that human beings are short-sighted. Put the two together, and you get a whole lot painful data loss every year. So take today, the day before potentially catastrophic April Fool&apos;s Day pranks, to make sure all of your valued digital data is stored somewhere safe that isn&apos;t your computer-- be it a USB stick, a portable hard drive or the cloud.